When it comes to ECG performance, this, friends and neighbors, is as good as it gets. The brand new Burdick 8500 ECG from Cardiac Science has blazed past every other ECG in the field, like a Ferrari in race against golf carts. (Well, maybe that's an exaggeration, but it's not that far off.) If you want the finest ECG results in your practice, this is the system. Nothing else is going to compare. The Burdick 8500 ECG / EKG shows you what you need, comfortably. Burdick 8500 ECG equipment has a friendly user interface, multi-angle 7-inch widescreen, and color display that makes reading waveform data easy, and protocol choices streamline your workflow. View continuous 3-, 6-, and 12-leads of data on the color display ECG. Adjust the unique 7-inch adjustable widescreen color display for contrast and viewability. Store up to 300 digital ECG records; enjoy on-screen QuickTips. Reduce typing mistakes and save time by downloading patient information from your electronic medical record (EMR/HIS) system. 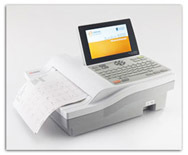 Eliminates the hassle of scanning and filing. Equipment includes an industry-leading, four-year warranty and service program for worry-free usage. Equipment includes an industry-leading data acquisition speed (64,000 sps) for pacemaker detection. The Burdick 8500 ECG cleans the ECG waveform before it is measured and analyzed by the Glasgow Royal Infirmary (GRI) algorithm. With more than 30 years of continuous refinement, the GRI algorithm is the first and only to consider five clinically significant variables – including gender, age, race, medication, and classification – to interpret patient data. Convenience. Export records to network drives, USB, or EMRs. Store up to 300 ECG records. Connectivity. Comes with Ethernet connectivity as a standard feature. It’s compatible with wireless 802.11, and has bidirectional communication with our HeartCentrix® connectivity solution. Ease of use. The easy-to-clean keyboard, dedicated functions keys, intuitive menu, and on-screen QuickTips make it easy to use. Performance. The AccuPrint™ feature restricts ECG printing if 10-second data quality is poor, ensuring a clear printout and eliminating retakes. Flexibility. The unit manually or automatically produces high quality 3-, 4-, 6-, and 12-lead ECG printouts. Durability. Known for its legendary durability and dependability, Burdick is the preferred name in digital ECGs, for practices and clinics. Primary or acute care use. The interpretation package provides a choice of brief or full-format statements (including reason statements). Trust Your ECG Results Only To The Very Best. Burdick has set the standard by which all other ECGs are compared. There are any number of other ECG systems on the market. But with Burdick (and its parent company, the inestimable Cardiac Science, standing behind them), you are in the most capable hands. No one else provides ECG excellence at this level. Burdick is the one name you can always and in every way trust with absolute confidence.